Meanwhile, in a dry large skillet, toast pecans over medium-low heat 6-8 minutes or until lightly browned, stirring frequently. Add syrup and butter; cook and stir until butter is melted. 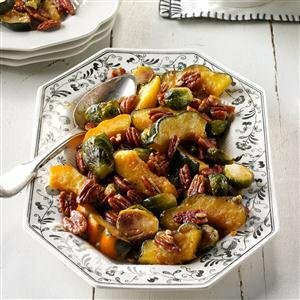 Sprinkle vegetables with pecan mixture; gently toss to combine. Makes 8 servings.